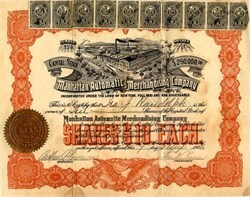 Beautiful certificate from the Manhattan Automatic Merchandising Company issued in 1907. This historic document has an ornate border around it with a vignette of the company's plant. This item has the signatures of the Company's President, W. MacEven and Secretary, Arthur Plowman and is over 102 years old. The certificate we have is the same design as certificate in scan, but this one is dated 1907 and it doesn't have any stamps attached to the face. Arthur Sydney Plowman: Merchant; b. Taunton, England, July 23, 1855; s. Thomas and Sarah (Barrett) Plowman; ed. Cheltenham Grammar Sen., and Kpsom Coll., England; m. 1st, A. M. Grant, of Hlllesden Collompton, Devon, England (deceased); 2d, A. L. E. Robertson, of Ar- brouth, Scotland. Sec. Hudson Trading Co.; sec. and treas. Manhattan Automatic Merchandising Co.; sec. Barrett Bros. Co., Inc. Address: 116 Nassau St., N. Y. City. PLl MB, William T.I Lawyer; grad. Univ. of Rochester, 1891; received Townsend Scholarship; studied law. Admitted to bar, 1893; has since practised In Rochester. Sec. Rochester Civil Service Commission, 1895; alderman, 1900-03; att'y for State comptroller In Inheritance tax matters, 1901-07. Address: 612 Wilder Bld'g. Rochester, N, Y.